The agenda for the Marple Area Committee Meeting on Wednesday 10 April has been published. As usual doors open around 5.30pm and the meeting starts at 6pm in the Marple Senior Citizens' Hall. The page includes a map of the Marple Wards so you can see exactly where the boundaries of Marple North and Marple South and High Lane are. It also features a live feed from the Stockport Council web site at the bottom that shows links to the latest agendas issued, meetings held etc. Thanks for reminder i do have it on calendar but its still nice to have reminder . The agenda for the Marple Area Committee Meeting on Wednesday 6 March has been published. 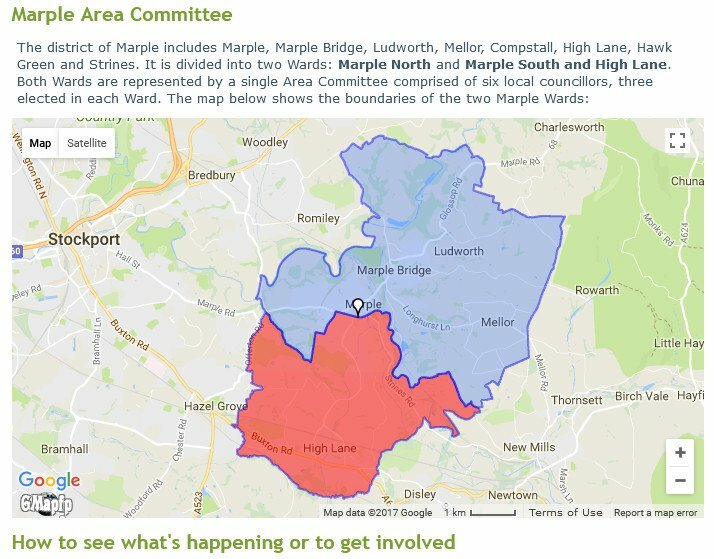 The agenda for the Marple Area Committee Meeting on Wednesday 30 January has been published. The agenda for the Marple Area Committee Meeting on Wednesday 12 December has been published. This month the long awaited Marple Wharf Development Application will be considered by Marple Councillors. This has been a controversial development that has been simmering for 10 years now and Marple Civic Society has spend a considerable amount of time and effort trying to encourage the Canal and River Trust to develop a scheme that will bring more benefit to the community. The Civic Society highlights that the most recent delays were due to the developer, H20 Urban, on behalf of Canal & River Trust, suggesting that our local councillors were compromised and therefore not fit to judge the planning application. It has now been confirmed that Marple Area Committee can consider this development next Wednesday evening. The planners are recommending that this application be granted. Read Marple Civic Society's Blog on this topic to learn more about the history of this application. Last week's area committee meeting is now available on-line. It would be good for the chair to repeat all questions clearly before they are answered. I will pass this suggestion onto the chair before the start of the meeting. You are right - that's why the officer, Steve Fox, asks speakers to use the microphones, although some members of the public prefer to speak from their seats. The agenda for the Marple Area Committee Meeting on Wednesday 7 November has been published. As usual doors open around 5.30pm and the meeting starts at 6pm in the Marple Senior Citizens' Hall.. It was expected that the Marple Wharf Development planning application would be considered this month but apparently this has been put-off once again. However, DC/065826 (Demolition of existing buildings and erection of mixed use development comprising 20 apartments and A1 retail floorspace (Amended Plans). | 92-94 Church Lane Marple Stockport SK6 7AR) is being considered. This of course is the demolition and development of the former Albert Schools building opposite the top end of Market Street and the planners are recommending that this be granted. Be prepared for some frustration though as you often cannot hear the public comments and questions, only the answers given by someone who has a microphone. Last night's Marple Area Committee was much quieter than expected for a big local issue like the Garden House. The Garden House application was (reluctantly in my view) refused by councillors on planning grounds and it seems a great shame that a compromise cannot be reached between the planners and the applicant's team, who I thought put their case very well. As a spectator, I found it much easier to follow what the applicants were saying than the planners. I guess that's not the end of it and the decision will be appealed, or the existing appeal that has been held in abeyance will now be heard. If you go onto www.stockport.gov.uk you will see a search bar. Entering webcast in this will bring up several links to previous meetings. If you do this about 15 mins before the session begins you should be able to see it but it will remain silent until the meeting officially begins. That’s how I used to do it, there may be a simpler way but this should work. There is a simpler way Steve and Amazon. There is a link from each agenda. You can watch it live on Wednesday at 6pm. It has now been confirmed that Marple Wharf planning application will not be considered at the 26 September Area Committee Meeting. Probably just as well as the Garden House on its own will draw the crowds! when can we see the webcast of this .